Posted June 1, 2011, 11:04 PM. Did it seem as if a new system was arriving each weekend this past month? That's because it was. The main culprit of the cooler, windier than normal weather we experienced over the last month in Southern California's inland valleys is the jet stream, which has sagged further south than usual and has been pumping systems through the area at the rate of more than one per week. "An active and unusually southern jet stream has brought several wind events to the area, especially the Coachella Valley, and wind prone higher terrain, as well across the Pacific waters," said Alex Tardy, a meteorologist with the National Weather Service. High pressure has had trouble getting established, although the first week of the month started warm. The rest of the month was decidedly cooler. In the inland valleys, average temperatures for the month were about three degrees below normal, and rainfall was higher than usual for what is nominally one of the driest months of the year (the new month, June, is statistically the driest). 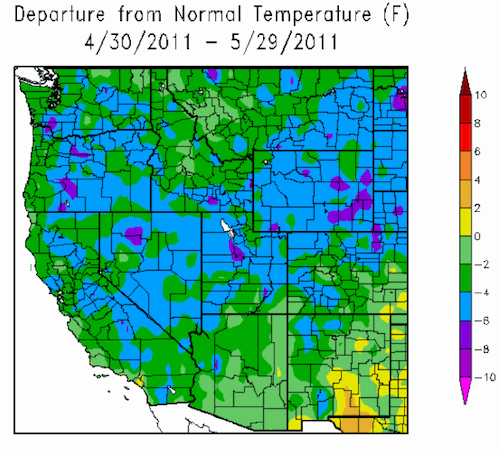 For WeatherCurrents' Temecula station, it was the coolest May on record, beating out a slightly warmer month last year. Records for Temecula go back to 2000. Stations in Murrieta, Hemet, Menifee, Lake Elsinore, Moreno Valley, Wildomar, Perris and French Valley also recorded their coolest Mays, based on average temperature. Most of the precipitation fell in one storm, May 17th through 18th. Totals for the month ranged from near normal in Hemet to three times average in Fallbrook and De Luz, but less than an inch in all locations. Towards the coast, temps were close to normal; rainfall was not. "For San Diego Lindbergh Field the average temperature for the month of May will come out very close to normal," said Tardy. "At San Diego Lindbergh Field there were 3 calendar days with more than 0.05 inches of rain (in other words more than just marine drizzle)." He added that the last time there were that many wet days was in May, 1998, a strong El Nino year. Note: normals are used for communities with five or more years of data, and do not include this past May.